Villa Tantawan is a three-bedroom luxury residence that showcases, most probably, the very best of Thai vacation living – as exemplified by the entire villa’s distinctively Thai contemporary architecture and design, by the craftsmanship of the stylish and elegant appointments, as well as by the captivating beauty of the villa’s natural setting. At Villa Tantawan, you will truly experience a holiday that is both dreamy and magical – one you will surely miss and always long for. Laid out alongside the villa is the infinity pool. Immersed in its cool and clear waters, you may never want to leave. 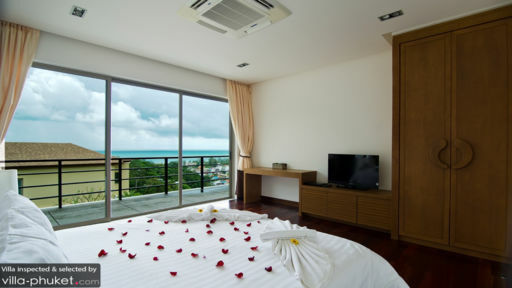 As you take a soothing dip or carelessly wade, you also get an unobstructed, panoramic view of the Andaman Sea and the verdant inland mountains. If ever you manage to climb out of the pool, you will remain hypnotized as you recline and stare out to sea on the pool beds at the covered terrace. Within the spacious indoors of the ground floor is the living area. On the large couch and seats you can all gather in time to catch the newest episode of your must-not-miss TV series. Right behind is the dining area with a long wooden table that can comfortably accommodate six. Here, you can impress your companions with a scrumptious menu you yourself put together at the fully-equipped, modern kitchen set up against the wall. Regular services at the villa include housekeeping, pool and garden maintenance, as well as security. 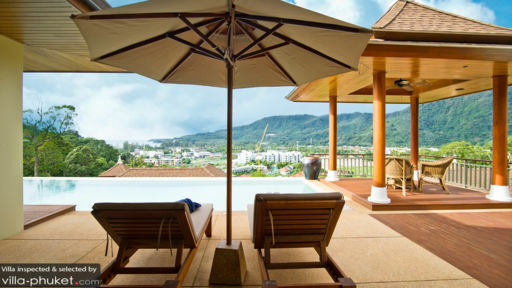 Villa Tantawan is located on the hills above Kamala Beach – one of the most beautiful spots in Phuket. With its very own bay and a fishing village amidst lush forests, the beach is quiet and more relaxed. The best part is along a walkway where you’ll find cozy, little places where you can enjoy your favorite cocktails – especially at sunset, as well as savor Thai or seafood specialties – served right on the sand. Make sure to catch Kamala’s night time attraction – an amazing circus show at the Phuket Fantasea Park. One other attraction you simply must go to is the all-day fresh market with fruits and vegetables like you’ve never seen before as well as snacks which will instantly become your favorites.